I love me some pico de gallo. Fresh, simple, insanely healthy, and beautiful to boot, this recipe is a simple spin on a classic. Here’s my only gripe about pico de gallo; it’s best drenched in lime juice and super ripe tomatoes. But all that liquid can leave you with soggy tortillas and chips. So what do we do? Enter the chia seed! These wonderful, little gems will be of great help here. 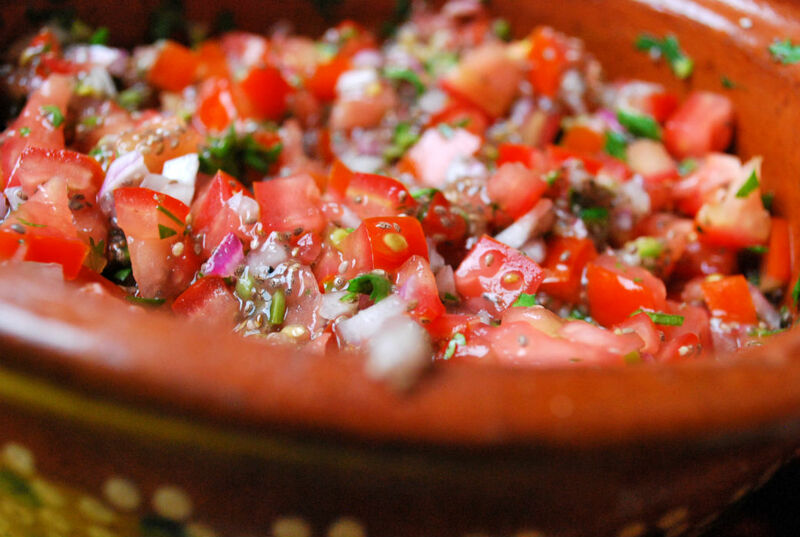 Chia absorbs much of the liquid from the tomatoes and lime in the pico de gallo without changing the flavor. 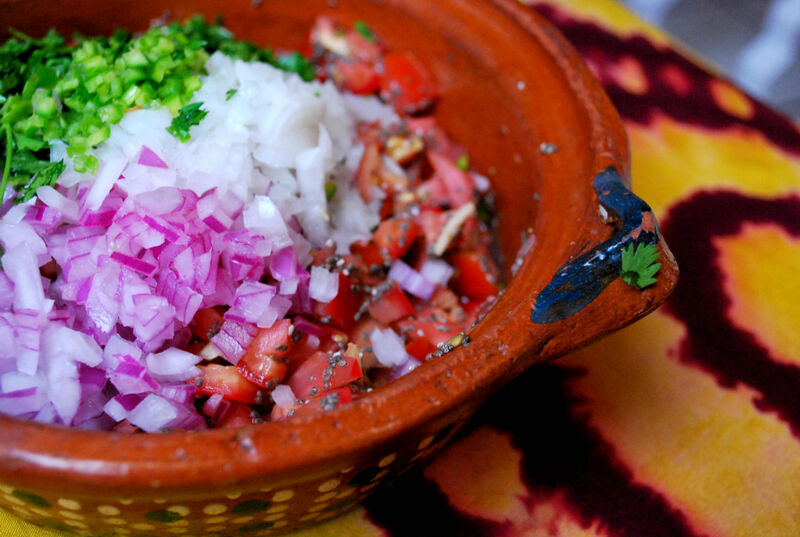 Additionally, it boosts the already uber-healthy profile of this traditional and refreshing salsa. A note on Chia Seeds: A long treasured ancient seed indigenous to Mexico, the Mayans and Aztecs used the chia seed for a myriad of applications back in the day. These teeny tiny seeds are absolutely chock full of omega-3s, protein, calcium, potassium, manganese, boron, and fiber, just to name a few. Beyond this stellar nutritional profile, they can absorb many more times their weight in water, which makes them a brilliant alternative to gelatin and can be used in all sorts of applications from sauces to milkshakes, without adding any bothersome flavor. They are abundant and cheap here in Mexico, but definitely available in the States, since they are very en vogue right now. Believe the hype and make the investment, for a teaspoon of these little buggers has the ability to transform a dish both nutritionally and texturally. Here ’s a good article on chia and plant-based diets. Sounds perfectly sensible, doesn’t it? So, let’s do this! Finely chop tomatoes, juice the limes, and mix with chia seeds and set aside. While preparing the rest of the salsa ingredients, the chia seeds will get to work absorbing the liquid of the tomatoes and lime. Finely chop onions, cilantro, and Serrano chiles. 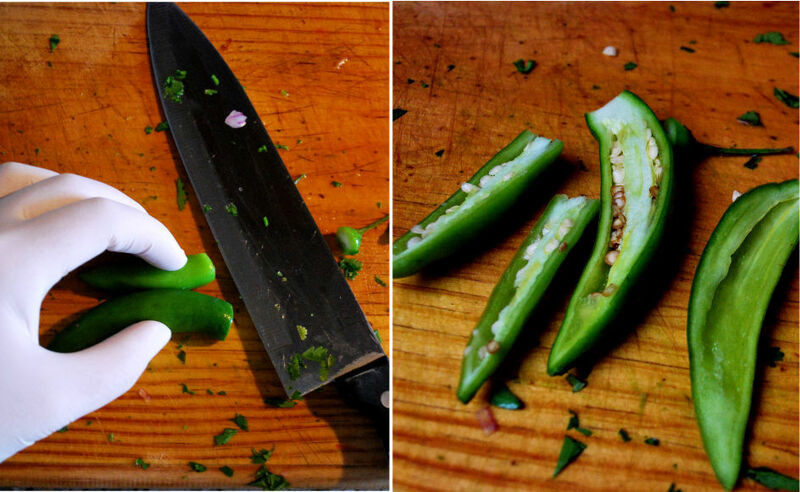 Serranos are tiny and extremely potent, so start with one pepper and work your way up in heat from there. Also, if you have senstitive skin like me, use gloves when chopping serranos, and scrape out the seeds and pith before chopping. There’s nothing quite like the burning of one’s nailbeds. Incorporate all ingredients together and season to taste. Yum. Yum. Yum.